St. Jude, known as Thaddaeus, was a brother of St. James the Lesser, and a relative of Jesus. Ancient writers tell us that he preached the Gospel in Judea, Samaria, Idumaea, Syria, Mesopotamia, and Lybia. According to Eusebius, he returned to Jerusalem in the year 62 and assisted at the election of his brother, St. Simeon, as Bishop of Jerusalem. He is an author of an epistle (letter) to the Churches of the East, in particular the Jewish converts, directed against the heresies of the Simonians, Nicolaites, and Gnostics. This Apostle is said to have suffered martyrdom in Armenia, which was then subject to Persia. The final conversion of the Armenian nation to Christianity did not take place until the third century A.D.
St. Jude was the one who asked Jesus at the Last Supper why He would not manifest Himself to the whole world after His resurrection. Little else is known of his life, but legend claims that he visited Beirut and Edessa. He was beaten to death with a club, then beheaded post-mortem in 1st century Persia. His relics reside at Saint Peter's in Rome, at Rheims, and at Toulouse, France. 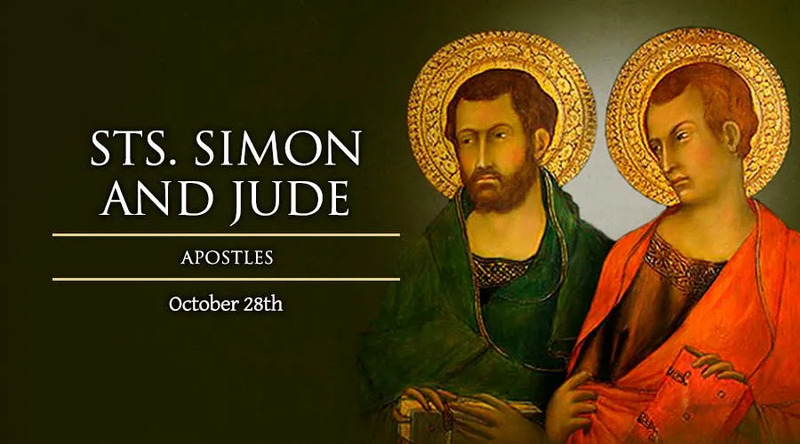 Saint Jude Thaddeus is not the same person as Judas Iscariot, who betrayed Our Lord and despaired because of his great sin and lack of trust in God's mercy. St. Jude Thaddeus is invoked in desperate situations because his New Testament letter stresses that the faithful should persevere in the environment of harsh, difficult circumstances, just as their forefathers had done before them. Therefore, he is the patron of desperate situations, forgotten causes, hospital workers, hospitals, impossible causes, lost causes, and the diocese of Saint Petersburg, Florida. He is represented as bearded man holding an oar, a boat, boat hook, a club, an axe or a book. Nearly every image of him depicts him wearing a medallion with a profile of Jesus. He usually has a small flame above his head and he often carries a pen. We remember him October 28 in Roman Church, and June 19 in Eastern Church. Little is known about the post-Pentecost life of St. Simon, who had been called a Zealot. He is thought to have preached in Egypt and then to have joined St. Jude in Persia. Here, he was supposedly martyred by being cut in half with a saw, a tool he is often depicted with. However, the 4th-century St. Basil the Great says he died in Edessa, peacefully.